Stephanie C: Hi, everybody. Welcome to the teleseminar series for The Nonfiction Authors Association. 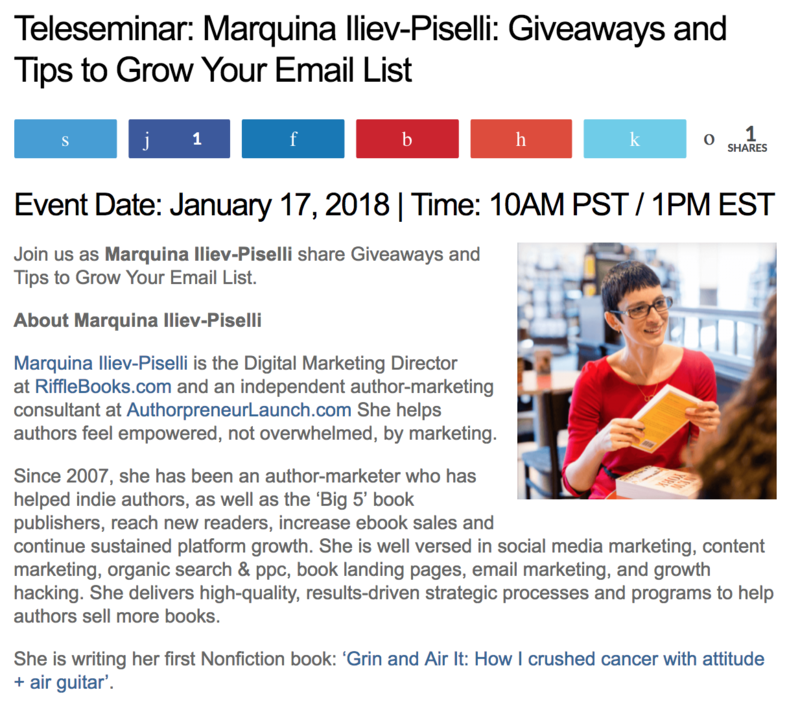 Today’s session is with Marquina Iliev Piselli, and we’re going to be talking about giveaways and tips to grow your mailing list. I am your host, Stephanie Chandler. Really appreciate you joining us today. As a reminder, we do have the phone line muted, and this session is recorded. This event will last 30 minutes, and recordings are available to authority and VIP members of The Nonfiction Authors Association. If you’re new to us, in addition to event recordings, authority and VIP members receive many additional benefits, including exclusive templates, checklists, and other content released every week, access to our active member forum on LinkedIn, free admission to local chapter meetings happening across the US, Canada, and in London, discounts off the Nonfiction Book Awards, Nonfiction Writers Conference, as well as our online courses and author toolkits and discounts with our partners, including Office Depot, PR Newswire, Gebbie Press, and Ingram Spark. You can learn more about us over at NonfictionAuthorsAssociation.com. Now, I am thrilled to introduce our guest today. Marquina Iliev Piselli is a digital marketing director at Riffle Books and an independent author marketing consultant at AuthorpreneurLaunch.com. She helps authors fill empowered and not overwhelmed by marketing. Since 2007, she’s been an author marketer who has helped Indie authors, as well as the Big 5 book publishers reach new readers, increase eBook sales and continue sustained platform growth. She is well-versed in social media marketing, content marketing, organic search and paper click, book landing pages, email marketing, and growth packing. She delivers high quality, results-driven, strategic processes and programs to help authors sell more books. She’s also writing her first nonfiction book, Grin and Air It: How I Crushed Cancer with Attitude and Air Guitar. I love that title. Marquina, thanks for joining us again. Marquina I.P. : Thank you, Stephanie. Wonderful to be here. Stephanie C: It’s great to have you back. Can we start by talking about lead magnets? Stephanie C: It’s a term that maybe not a lot of authors are familiar with. Can you talk about what they are and how authors can use them to grow a mailing list? Marquina I.P. : Absolutely. A lead magnet is a digital download or similar to a PDF. It’s really just a fancy way of describing something that could have once been a Word document, then you changed the format into a PDF so someone can’t edit it, and it’s a way of someone downloading content from the Internet and reading it offline. It’s called a lead magnet, in this instance, for this marketing purpose because it’s something that you use to get a new lead; a new person that might potentially buy your book. That’s the idea behind creating lead magnets. Stephanie C: What would be some examples of the type of content you’d want to put into one of those PDF downloads? Marquina I.P. : One example that many people have probably encountered are checklists. If you’re writing a how-to book, that checklist would say something to the effect of, “The Best Ways to do XYZ…” or, “Your Book Launch Checklist,” for example, would be an example of a digital download. Another example would be a how-to guide or you can also give them the first chapter of your book, and it’s a teaser for the rest of what your book is going to be about. One of my author-clients that I’m working with now is a therapist and she’s written a book called Anxiety Relief for Kids. We developed three different lead magnets for three different audiences, one is for parents, another for therapists, and a third for pediatricians. Each of these lead magnets are different pieces of content tailored to that specific audience. They actually were appropriated from her blog posts that were targeting those audiences, as well, and we fancied them up a bit with a nice cover, and we target those three different audiences and give them that piece of content to have them begin to learn more about Dr. Bridget Walker and her practice. That’s one very specific example. Stephanie C: That’s a great example. Marquina I.P. : One quick thing I’d like to reiterate is that a lead magnet has content related to your book, but does not ‘give away’ the thesis or ‘meat’ of your entire book. You definitely don’t want to give it all away. Stephanie C: Got it. I love the first chapter example, and I’m also thinking about our memoir writers. This gets back to knowing what your topic is or what your focus is on your book. Stephanie C: Maybe if your memoir’s set in the south, you’ve got southern recipes or something like that. Stephanie C: You have to get creative, and it should be something that people are excited to download because we’re asking them to give us their email address. I did tell you that with The Nonfiction Authors Association, we do a lot of free reports and things just like this, and I would imagine people listening to this found us because of some of those free reports. Can you talk about some of the tools that you recommend for setting up these lead magnets? Marquina I.P. : Yes. Not to be confused with some of the landing page tools, the tools actually create a lead magnet and turn your Word document or blog into a beautifully designed and downloadable PDF. My favorite tool is called Designrr.io. It’s not very expensive. I think it’s around $125 for unlimited use and is a tool you purchase once but can use over and over. If you were to hire a graphic designer to create a beautifully designed lead magnet from your content, you may spend $100 per hour. You can use designer.io to easily create lead magnets yourself from word documents and blog posts. You can easily paste your blog URL and the system pulls in the text. Then, you add a cover, you can use a beautiful image from their library or upload your own, and it will create, within a few minutes, a lead magnet for you. The designer lead magnet creator should not be confused with other landing page creation tools, like LeadPages or Unbounce. These two tools are for quickly creating single-page websites, called landing pages. These landing pages are a destination where a new potential reader actually puts in their email to receive a lead magnet. If you would like another alternative, you can try Fiverr to find a freelance designer. My only caveat to that is it is hard to find a quality designer on that site for such a low price, and it’s the difference between quick turnaround versus quality. I’ve tried all of the above I prefer the experience and control with Designrr. Stephanie C: That’s good. You mentioned blogs. That made me think, too, that if you’re keeping a blog, that’s also a great source for you to find content for your lead magnets. You’ve already probably created some content that you could turn into one of these digital downloads, right? Marquina I.P. : Yes. That is the hope; to repurpose your writing, the writing that you’ve already done, stuff you’ve already worked so hard on. If someone’s interested in your book, they’re probably interested in an essay you wrote, for example. When thinking about lead magnet content, you’re trying not to reinvent the wheel. You want to choose content that is related to your story, but not directly a part of your book. Stephanie C: Then you mentioned a site called Lead Pages, and this would be how you create your landing page, to register for the digital downloads. We use Lead Pages, as well. It is a paid service. Are there any other tools like that that you like and recommend? Marquina I.P. : The other one that I mentioned briefly that I personally like is Unbounce. It is, again, a paid service. The reason I like it better than, say, if I went to GoDaddy and used their quick landing page creator is that it Unbounce is easier to edit and A/B test. I’ll use Unbounce, for example, to do a pre-order campaign with a certain offer, including my lead magnet as one of the freebies that I’m giving away, and then after the pre-order campaign is over, I can quickly change the words and rearrange the page to be an order, an actual sales page for the launch, the real campaign. Stephanie C: The reason that we want a landing page is so that you make it easy for people to see the offer, see the digital download and input their email address and then receive the download immediately. There’s that instant gratification, that you don’t want to have to be manually sending these out a day after somebody’s registered, right? Stephanie C: You want to simplify that whole process. Marquina I.P. : That is a very important point. It is very difficult to have a pile of emails stack up where you have to send that PDF from your desktop. Those services that we mentioned, Lead Pages and Unbounce, being our favorites can help you automate that, the giving of the freebie, so it doesn’t cause you additional work. Stephanie C: It also makes sure your customer happy because they’re getting it right away. Marquina I.P. : Of course. Of course. Stephanie C: Next step, it would be a Facebook ad. This is where I think Facebook ads really excel. I tell authors, “Just advertising your book on Facebook is rarely a strategy that’s going to work to generate sales.” I personally use Facebook ads as a way to build the mailing list. Can you talk about how Facebook ads work with these kinds of promotions? Marquina I.P. : Yes. When you create a Facebook ad, there are many types to choose from. Among those options is something called a lead ad. That lead ad, when you create it, is actually doing a couple things for you. It creates a space for you to have a form inside the ad, and Facebook pre-populates some of the fields for you. Everyone who signed up for Facebook already has their email and name in the system. With a lead ad, you could add a field to receive phone numbers, street address, or zip code. If the info you request in the form field is available, it will be pre-populated. The potential subscriber only needs to click once to sign up to receive your lead magnet and be subscribed to your email newsletter. It’s so different from, say, creating the form online on your website, and the person has to type everything in anew, a first name, last name, email. Creating that kind of form in Facebook is less of a barrier to entry. We always want to create less friction between the time when someone sees your offer and enters the email because the more time there is, the less likely they are to actually complete that process. Facebook allows you with the lead ad to set up just a step or two to create a way for someone to go directly into your email list without having to type anything, just hitting the button, learn more, or receive now, or whatever it is that you make the text of that button. In addition to the ad design, ad targeting is extremely important. On Facebook, you can find people with so many varying interests. Consider who reads your books and why. An exercise to help you think about your target audience is to create a ‘persona’ and think about how that persona or ideal customer interacts with the world. With regard to creation and placement, a strategy for creating Facebook ads that will convert in to create a battery of 10 of them to start, more if you can, have a very high bid at the beginning, and then you get up to 3,000 impressions. At 3,000 impressions, you can see whether or not the ads are converting, and anything that is converting with more than, say, $2 per, or $5 to start to get on your email list, you should shut off so you’re not actually spending your full budget, but you’re learning from that initial setup what images worked. With that new understanding, you can tweak your ads, make some slight variations in text, add a new image or two. Your goal is to get conversions on your list for less than $2 each. Assuming your book costs around $9.99 to $15, then you are able to see a profit on each sale. If your books sell around $0.99, your strategy is to sell multiple titles to the same person. I can give a quick example of a nice way of setting up your Facebook ad. Some of the text should have the initial offer, a little bit of social proof, maybe a quote related to a stellar book review: if it’s possible, just have somebody say something really kind about you and your book, like, “This book helps me X, Y, Z.” The button should say, “Learn more” and not “Subscribe now.” Use the words, “Learn more,” because the next page in a lead ad gives the potential subscriber a little bit more information than typically Facebook ads and the bullet points. You can say, “When you sign up, you will receive A, B, and C,” or, if it’s not more than one thing, the download will tell you A, B, and C, and then they just hit, “Send it to me,” or you can change the button to say something related to the content, like, “Sign me up,” or, “I want it now,” and then that button is the call to action that triggers the signup to your list and the recipient will also receive the lead magnet content. Stephanie C: Now, you mentioned targeting. Part of this is figuring out what audience to promote it to because Facebook has all kinds of demographics that you could choose from, right? Stephanie C: Do you have some suggestions on how to choose your target audiences? Marquina I.P. : Yes. It’s very important to find your right target audience. It’s actually good to have a conversation with someone to get at your target audience. When I work with my clients, I will talk about all the people that have purchased their book in the past or the people that they’ve worked with or who they think will read the book. Who is the book really for? When we go through that process, we get a list of maybe there are six different audiences. That might be too much to start out with. Try to narrow it down to three because in those … Two or three, not too many because even within those different target audiences, there are ways to delineate even further. I’ll give an example of my therapist-client again. When we did pediatricians as one of the audiences, we looked at if it would convert higher if we targeted “Pediatricians” as a profession versus “Pediatrics” as an interest. I’m a parent. I might have an interest in pediatrics, but I’m not a pediatrician, and the ad actually converted much differently based on that distinction. The same text at targeting two different audiences can alter the results. If you’re targeting parents, for example, I targeted parents of very young children, parents of slightly older children… On Facebook, you can target parents with children of different ages. The age ranges are about five or six years. You could find out exactly what age is the child when the parent is signing up to receive the guide. This type of targeting helps you find who is actually interested in reading your material. The results can be fascinating because who you think wants to read your book may not actually be who is interested in reading your book. Stephanie C: That’s cool. Another strategy we love is to also target your competing authors. Stephanie C: If there are authors who write similar books to you and they have a large Facebook following, you can actually feed ads to their audience, which is pretty powerful, right? Marquina I.P. : Exactly, mm-hmm (affirmative). Stephanie C: We love that one. Well, this is great. Another list building tool that you like involves using contests. Can you talk about some of the ways that authors might use contests and giveaways? Marquina I.P. : Yes. My favorite two platforms for creating a giveaway or a contest … Well, actually, there’s three. The two paid ones are Rafflecopter and Gleam.io, and there’s always the GoodReads giveaway, as well. I’m going to talk about the Rafflecopter and Gleam giveaways first. When setting up those, if you … You can really have a successful campaign using the free tool. I’ve definitely seen authors use, in particular, it was actually both to create a good giveaway. Without paying for them, it is a little bit more difficult in terms of you cannot grow your email list. You’ll be doing a successful giveaway, but you won’t be able to capture the emails. Those two platforms, if you pay, you’re then able to sign up people for your newsletter because signing up for your newsletter can be a condition of entry into the giveaway. An example of a recent giveaway can be giving away five copies of your book, and when you do that, one thing to note, you cannot make purchasing your book a requirement to enter your giveaway. It is illegal in the United States to have purchase required for entry. What you can do to get around it in this sense is have someone consider your book, say on Amazon, and have a link there and you’re giving them points in the giveaway just by looking at it, considering it, and seeing the price. Considering how variable pricing can be sometimes; even my current client’s book has changed from $12 to $16 and back down again. It’s interesting for people to see the prices change, and sometimes that alone drives purchase. You could give entrants additional opportunities for entries such as following you on Twitter or liking on Facebook. In this way, your giveaway can also be used to increase your social presence. Stephanie C: Then can you maybe break it down with Rafflecopter, how does that help you manage the giveaway process or promote it? Marquina I.P. : Great question. The reason why you use a tool like Rafflecopter or Gleam is you can see how many entries you’ve had, and it also helps you choose a winner, a random selection of the winner can be very helpful, especially if there are, say, five winners, you didn’t hear back from someone, you can refresh it and it will choose new winners for you. Marquina I.P. : Through those platforms, you can also share on Facebook and Twitter and other social outlets, and the platforms allow the entire process of managing a giveaway to be quite easy. Stephanie C: Very cool. You could be giving away copies of your book, maybe an hour of consulting time with you. There are all kinds of ways. We’ve done contests with vendors where, for example, one year, HP donated brand new printers that we gave away using a blog comment contest. I love these, especially if you’re requiring people to register in order to enter. Like you said, you can’t charge them something to enter a contest, but if they register with an email address, that’s a win/win. Stephanie C: Once you’ve added these people to your mailing list, what are some of your best tips for automating your email correspondence and generating book sales as a result of these efforts? Marquina I.P. : One of the best things that I’ve found to continually sell from an email list without too much effort is to create an email automation. What I mean by that is there’s a series of maybe three to five emails that go out on a schedule to any new subscriber to your list. I know that the most popular platform is MailChimp. It’s very easy to create an automation in MailChimp, but almost every other email content management or email management system has added an automation because they’re so successful. It is actually something that you would need to set up beforehand. In MailChimp, you go in and you can put, “Create new email automation,” and it’ll say, “How many emails do you want?” It’ll say a space with five blanks will show up, basically like five emails, and you can fill those in. To fill them in, a good strategy is to bring people into your world a little bit. Over the course of maybe two weeks, the email can go out every three days, maybe three or four days, and the new subscriber gets to know you and your content, about your philosophy, if you’re writing a nonfiction or how-to book, and throughout that email automation, you can mention your current book, your past books, articles that you’ve written, and towards the end of it, you ask for the sale. You can ask for it more than one time in there, but it’s usually around the third or fifth email you have your offer. Maybe you offer something in addition or you can decide what your offer is, but “Buy the book now,” can be one of the messages in there. When creating the automation, again, try to think about repurposing content, again the content on your blog, for example. I’ll give you a very specific example. I have another client who is a health and wellness coach from Trinidad. She also is an author and creates recipe books. To create her automation, we thought about a couple things: Did we want to include wellness tips? Did we want to include recipes? How many? In the end, we used the automation to bring a new subscriber on a journey to understand my client’s holistic philosophy, included some encouraging information from past weight loss success stories, and we added a combination of recipes, tips, and inspiration. Our end result is a five-email automation where the first email is about, “Hi. Welcome to my Green Team,” and it’s about her philosophy. The second one has to do with her personal journey and story. The third one has to do with one of her programs and some successes and testimonials from people who took that program. The fourth is some more in-depth information about what one of the programs entails, having to do with weight loss. The fifth has a sale message, is “Why wait?” I don’t know. Pushing everyone, enthusiasm to say, “You’ve come this far. Let’s do this together.” It has an option, either, “Work with me this way, enter one of my programs or you can work with me this way by going through the program in my book.” It’s actually one of those alternative of choice sales where each choice is a sale. They either purchase the higher-end program or they can receive her book. Both choices are a ‘win’. Her book is given away for free at her programs, so either way, people are choosing to engage further with my client’s content. They are being moved down permission-based sales funnel. The automation is a way for new potential clients to find out what she is all about, decide if they like philosophy, decide if they can trust her, and they are in control to choose a way to continue engaging with my client and her content. The great part about that is, in addition to going through the automation, since the individuals are on the email list, as she continues to write her bi-weekly blog posts, those individuals receive those messages, as well. It was almost like an onboarding or a ramping up to being part of her … in her ‘green’ healthy world, in her milieu. Stephanie C: That’s a great example. Another term for these are auto-responders, right? Stephanie C: Whether you use MailChimp or Constant Contact or AWeber, they all have this ability to set up auto-responders. Just for another example, we use them, too, so when you sign up for our mailing list or download one of our free reports, there’s the series of emails that come out, and they give you more content, “So go download these three free reports,” and it takes you through it. What I love about that is that it builds a lot of loyalty with our recipients. Not a week goes by that we don’t get responses from people thanking us for the content. I think that for authors that are thinking about this, think about how you can use these auto-responders to give even more value, maybe even exceed the expectations because I think the flip side is we don’t want to annoy people. In fact, this morning I was on email, and I just went through on an unsubscribe binge. You know how you get to that point we’re like, “Why am I getting all this mail? I don’t need to know my weekly concert updates every other day for the local events.” That’s the risk that you annoy them by sending too much mail or you dazzle them by giving them something of value. Wouldn’t you say that’s the distinction there? Marquina I.P. : Yes. It’s great to have someone else to bounce content ideas around with you. I know there’s a lot of community and helpful advice when one is a part of The Nonfiction Authors Association. You can talk to people to see if the content that you think is valuable really is of value, is of value to another person, help you do that. Stephanie C: That’s a great suggestion. I love that. Marquina, this has been really helpful. Could you bring us home with what key takeaways you want our listeners to remember today? Marquina I.P. : Absolutely. What was talked about today sounds like a lot, but, really, there are three main elements to create what ends up being a sales funnel for you. The first main element is the ads on Facebook, and the importance of the image, copy, and color. The second element are the downloads or lead magnets. Deciding what is that content, and who is it for? The third is the automation, which is the campaign that sells for you over a period of time and brings someone into your world. Those are the three main elements. Stephanie C: Great. Can you remind our listeners how they can connect with you? Marquina: Sure. If you’re interested in any of my online coursework or working with me, you can go to AuthorpreneurLaunch.com and click the Start Here button and you can see some of my online courses. You can also sign up to download The Author Platform Blueprint, which will also place you on my email list. If you’re interested in potentially hearing more about the book, go to MarquinaMarie.com/book. Stephanie: Great. Congratulations on that. You obviously have been through a great journey and thank you again for being our guest today. Marquina: Thanks so much, Stephanie. Have a good day. Stephanie: And thanks to our listeners for joining us. We conduct these teleseminars every Wednesday and you can check the schedule or sign up for our mailing list to get notified over at NonfictionAuthorsAssociation.com. I hope y’all have a fabulous day.